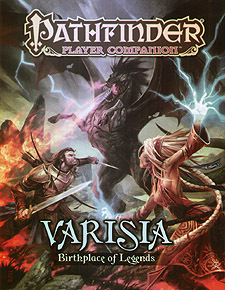 Begin an adventure like no other in Varisia, a land of ancient mysteries and fantastic danger. Within this book you'll find countless player-friendly possibilities as you explore one of the most richly detailed corners of the Pathfinder campaign setting. Will you indulge fortune as a Varisian wanderer, retake your tribal lands as a fierce Shoanti barbarian, uncover the secrets of a lost arcane empire, or fight to protect our peaceful home from dark magic and fierce monsters? The choices are endless, but you'll find the ones that are right for you with this primer to an entire realm of adventure. A bold new format with new features, revealing more exciting topics, options, and inspirations every time you turn the page. A look into the lives of Varisia's native peoples, the proud tribal Shoanti and far-travelling Varisians, with new ways to play members of both cultures. New archetypes, feats, equipment, and traits to make characters a part of Varisia, plus many that link to Adventure Paths set in the region, like Rise of the Runelords. A player-friendly map of Varisia, featuring major settlements, distances between locations, and hints at adventure sites to explore. A player's guide for the Shattered Star Adventure Path, giving players everything they need to know to create characters ready to face this deadly new campaign.